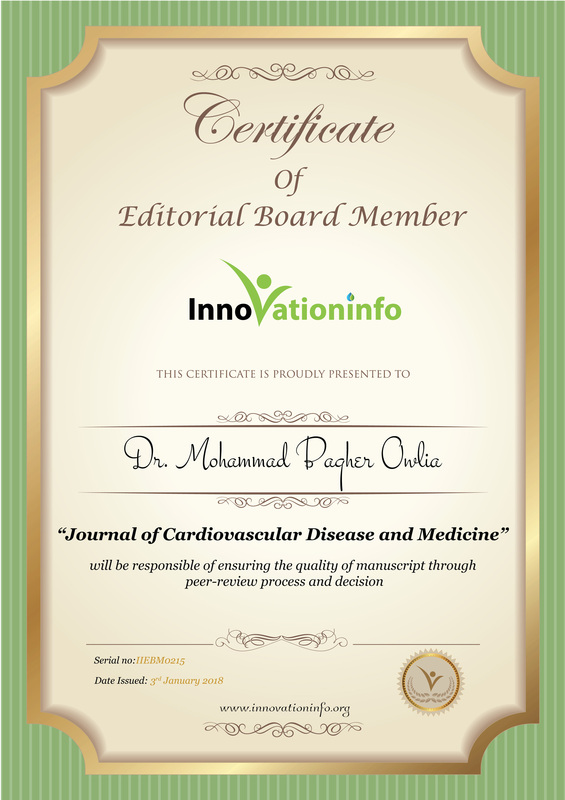 Designation: Professor of Medicine, Shahid Sadoughi University of Medical Sciences, Yazd, Iran. 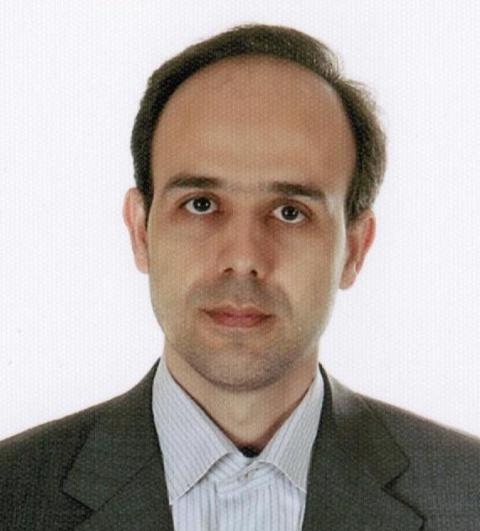 Biography: Mohammad Bagher Owlia is Professor of Medicine, Shahid Sadoughi University of Medical Sciences, Yazd, Iran, He has Editorial board member, Cardiology Open access, Member of Scientific committee, University scientometrics, SSU, Head, International office, SSU, He got Professorship in Internal Medicine, Winner of best abstract award, APLAR 2012, Dead Sea, Amman, Jordan, Sept 10-14, 2012 awards. Owlia MB, Inflammatory Schmorl’s Nodes” as Subtle Early Manifestations of Inflammatory Spinal Disorders , J Spine 2012, 1: e104. Owlia MB, Farahifard P (2013) Historical Schmorl’s Node: Time to Differentiation and Renaming. J Spine 2: e109. doi:10.4172/2165-7939.1000e109. M Owlia, Golden Tips to Diagnose Low Back Pain Better, Faster and Easier A Useful Guide for Practitioners, 2015, , J Spine 4, e120. M Ghasemian, MB Owlia, A different look at pulsed glucocorticoid protocols; is high dose oral prednisolone really necessary just after initiation of pulse therapy? Journal of Case Reports in Practice 2015, 3 (1), 1-3. MB Owlia, Acute Rheumatic Fever (ARF); Let’s Think Beyond Old Believes! A Simple Reasoning Behind a Huge Fact, Journal of Cardiology and Therapy 2016, 3 (2), 506-507. MB Owlia, Is Acute Coronary Syndrome Secondary to Coronary Vasculitis Underestimated in Daily Cardiology Practice? Journal of Cardiology and Therapy 2016, 3 (2), 504-505. Diffuse Alveolar Hemorrhage (DAH) in years, A Cohort Study, Final Phase, A.Halvani, MB Owlia, H. Soleimani..
ANCA in Rheumatologic Disorders, A. Haghighi, J. Forghanizadeh, M B Owlia, M.Salekmoghadam. , JIACM, Oct 2005, 6(3):216-219. The Cut-off Point of Dual Energy X-ray and Laser (DXL) of Calcaneus Method for Osteoporosis, Diagnosis in Postmenopausal Women. A. Salimzadeh, B. Forough, Owlia MB, S. Sharghi, G. Hossein Alishiri, , Iranian journal of radiation research (IJRR), 2005;3(2):69-72. (Index Copernicus indexed). Needle Muscle Biopsy using Pleural Biopsy Needle for Diagnosis of Inflammatory Muscle Diseases, Owlia MB , JIACM, 2005,6(4); 281-284 (Indmed indexed). APA in CVA under 50 Years of Age, Owlia MB, J Indian Rheumatology Association, Dec 2005; 13:140-142. Effect of Ginger in Knee Osteoarthritis, A Haghighi, N Tavalaei, M B Owlia, Indian Journal of Rheumatology, June 2006; 1(1): 3-7 (EMBASE indexed). Amyloidosis in Long Lasted RA Cases using Subcutaneous Fat Pad Aspiration , Owlia MB, Journal of IUMS, 2006;13 (50):121-126. Prevalence of Deposition of Amyloid in Long Standing RA by Abdominal Fat Biopsy. BMC Musculoskeletal, Owlia MB, 2006, 7:43 (Medline indexed). Osteoporosis in Elderly Women, Owlia MB, Iranian Journal of Surgery, 2006; 14(1), 71-78. Vertebral Morphometry Reference Data by X-ray Absorptiometry (MXA) in Iranian Women, Owlia MB, Clinical Rheumatology, 2007; 26: 704-709 (Medline index). Comparison of Two Doses of Corticosteroid in Epidural Steroid Injection in Lumbar Radicular Pains, Owlia MB, Singapore Med journal, 2007, 48 (3) (Medline Indexed). Cryoglobulinaemia in Hepatitis-C Positive Patients in Iran, Owlia MB, Singapore Medical Journal, 2007; 48 (12): 1136-1139, (Medline indexed). AOSD report of 28 cases and review of the literature, Mehrpour G, Owlia MB, Soleimani H, Ayatollahi J, Modern Rheumatology 2008; 18:480–485. (Pubmed indexed). Interrelationship between radiographic findings of hand and bone mineral density in patients with rheumatoid arthritis, Owlia MB, Rezvaninejad S, Soleimani H, journal of SSUMS 2008, 16(2): 44-48. Patients’ believes about the effect of food on musculoskeletal pain, Hormozgan Med J. 2008; 12(3)161-167. Dexamethasone in peritonsilar abscess, Journal of SSUMS, 2009,16(4): 32-37. The effect of active learning method on stability of information and satisfaction of students, Iranian J of medical education, 2009, 9(3) 208-214. Antiphospholipid Antibodies in Venous Thromboembolism Patients Younger than 50 Years Old, A. Halvani, Owlia MB, A Miratashi, G Mehrpoor, Tanaffos journal, 2010, 9(2); 26-32. SPEP as a marker of inflammation, Iranian Journal of Rheumatology, 2011, 1(1): 2-5. Bed-time single dose prednisolone in stable rheumatoid arthritis, ISRN Pharmacology, 2012, (PubMed indexed). Pattern of rheumatic diseases in Iran, IJRD, Jan 2011 (PubMed indexed). The Effect of Garlic Tablet on Pro-inflammatory Cytokines in Postmenopausal Osteoporotic Women, Mozaffari-Khosravi H, Hesabgar HA, Owlia MB, Hadinedoushan H, Barzegar K, Fllahzadeh MH, J Diet Suppl. 2012 Dec;9(4):262-71, (PubMed indexed). Rheumatological findings in candidates for valvular heart surgery. Owlia MB, Mirhosseini SJ, Naderi N, Mostafavi Pour Manshadi SM, Ali Hassan Sayegh S. ISRN Rheumatol. 2012;2012:927923. doi: 10.5402/2012/927923. Epub 2012 Oct 31. Effects of training intervention on non-ergonomic positions among VDT users, Mirmohammadi SJ, Mehrparvar AH, Owlia MB, Mirmohammadi M. Work, 2012; 42 (3):429-33. Comparison Between NSAID and Intra-articular Corticosteroid Injection in Frozen Shoulder of Diabetic Patients, A. Dehghan, N. Pishgooei, M.-A. Salami, S. M. M. zarch, R. Nafi si-moghadam , S. Rahimpour, H. Soleimani , Owlia MB, Exp Clin Endocrinol Diabetes 2013; 121: 75–79. Systemic Aspects of Soft Tissue Rheumatic Disorders (STRDs), Owlia MB and Golbarg Mehrpoor, Journal of the College of Physicians and Surgeons Pakistan 2014, Vol. 24 (6): 432-434. Owlia MB, M Ahmadpour-Baghdadabad, A Dehghan, H Soleymani, Limb gangrene: What is the best initial approach? A problem with serious controversy among rheumatologists, , American Journal of Experimental and Clinical Research 1 (3), 47-51. G MEHRPOOR, Owlia MB, MR MIRJALILI, A FARZAN, A AKRAMI, Complementary alternative medicine in rheumatologic diseases; data from outpatient clinics in Yazd, Iran, , Journal of Case Reports in Practice (JCRP) 2 (3), 92-96. A Dehghan, S Rahimpour, H Soleymani-Salehabadi, Owlia MB, Role of vitamin D in flare ups of rheumatoid arthritis, , Zeitschrift für Rheumatologie, 1-4. J Mohiti-Ardekani, H Soleymani-Salehabadi, Owlia MB, A Mohiti, Relationships between serum adipocyte hormones (adiponectin, leptin, resistin), bone mineral density and bone metabolic markers in osteoporosis patients, , Journal of bone and mineral metabolism, 1-5. Dahaj, M Lotfi, A Dehghan, G Mehrpoor, H Soleimani, Owlia MB, Conservative Management of Acute Lumbar Disc Herniation, , AA, J Spine 2 (134), 2. MB Owlia, M Danesh-Ardakani, Frequency of sacroiliitis among patients with low back pain, Electronic physician 2016, 8 (3), 2094. M Ghasemian, S Owlia, MB Owlia, Review of anti-inflammatory herbal medicines, Advances in pharmacological sciences 2016. Clinical Spectrum of Connective Tissue Diseases, JIACM, July 2006; 7(3): 217-224. (Invited Review). Adult-onset Still’s disease, 2009, Indian Journal of Medical Sciences, 2009, (ISI & PubMed indexed). Viral hepatitis in pregnancy, J Ayatollahi, Sh Taghipour, Owlia MB, Gyn Obst Infert Journal, 2009, 12(2):57-63. Is the role of Chlamydia is underestimated in patients with reactive arthritis? Owlia MB, A R Eley, Int J Rheumatic Diseases. (ISI & PubMed indexed), 2010; 13:27-38. Hepatitis C, Diagnosis and treatment, J Ayatollahi, Owlia MB, M Sajjadi, Journal of SSUMS,2010, 17(4): 396-403. Behcet disease, cardiovascular involvement, future direction in treatment, Owlia MB, Golbarg Mehrpor, M Modares Mosadegh, ISRN pharmacology, 2012, (Pub Med indexed). Occupational hazards to dental staff, J Ayatollahi, F Ayatollahi, A Mellat, R Bahrololoomi, Owlia MB, Dental Research Journal, Jan 2012, 9(1): 2-7. Cardiac manifestations of rheumatologic conditions, Owlia MB, Mostafavi Pour Manshadi SM, Naderi N, ISRN Rheumatol. 2012; 2012:463620. doi: 10.5402/2012/463620. Epub 2012 Oct 1, ISRN Rheumatol. 2012. Management of immne cytopenia in SLE, Newman K, Owlia MB, El-Hemaidi I, Akhtari M. Autoimmun Rev. 2013 May;12(7):784-91. Ghasemian M, Owlia S, Owlia MB, Review of Anti-Inflammatory Herbal Medicines. Adv Pharmacol Sci. 2016;2016:9130979. doi: 10.1155/2016/9130979. Epub 2016 May 10. Review. MTX- induced pneumonitis in a patient with PsA (case report). Hormozgan Med J 2002; 6(3):35-37. RSDS due to Cyclosporine (case report) Hormozgan Med J. 2002; 6(2):47-49. Scleroderma-like syndrome (Werner`s syndrome) (case report) J of IUMS 2003;9(32):637-640. Adult onset still disease presenting first in pregnancy (case report) J of SSUMS 2003;11(2):67-70. Werner`s syndrome in 3 members of a family, Hormozgan Med J (case report) 2003; 7(2):96-98. Oncogenic rickets associated with Schwannoma (case report). Kowsar med J 2003;8(4):34-44. Cryoglobulinemic vasculitis associated with hepatitis C virus (case report) Hormozgan Med J 2003; 7(3): 157-160. Intractable rickets as presenting feature of Wilson`s disease (case report). (J of Indian academy of clinical medicine July-Sept 2004; 5(3):277-280 available at: http://medind.nic.in/jac/t04/i3/jact04i3p277.pdf. Familial aggregation of FMF in twins and Behcet`s disease in their mothers, journal of SSUMS 2004, 12(2):87-90. Lesch-Nyhan`s syndrome and Allopurinol desensitization (case report), journal of TUMS, 2004,62(6):457-500. Amyloid arthropathy with synovial calcification in the course of multiple myeloma (case report), Alishiri Gh, Javadzadeh A, MB Owlia, Sadrodini S. 11th APLAR congress Sept 11-15, 2004, Jeju, Korea (abstract book; page: 192-193). Diabetic muscle infarction presenting as knee arthritis., Haghighi A, MB Owlia, Alishiri Gh. SSUMS, 2005,13(1), 71-75. Overlap syndrome with extensive lung involvement, journal of SSUMS, 2005, 12,(4); 95-99 . Macrophage activation syndrome and TTP are they from single spectrum?, JIACM 2005, 6(4); 337-40. Hereditary sensory neural neuropathy (HSN-I), APLAR Journal of Rheumatology 2006; 9: 301–303 (Ovid indexed). Graves disease as presenting feature of Wegener's granulomatosis. journal of Tanaffos, 2006; 5(4): 75-78. Successful control of Diffuse alveolar hemorrhage with Tranexamic acid, journal of TUMS, 2007, 64 (11);87-91. Multicentric reticulohistiocytosis, Owlia, MB; Mehrpoor, G; Soleimani, H, APLAR journal of rheumatology, Volume 10, Number 4, December 2007 , pp. 330-332(3). Pseudotumor cerebri and Behcet’s disease (case report), Soleimani H, Karimi M, Owlia MB, Javadpour MR, journal of SSUMS 2008, 16(2):80-83. Rituximab in AOSD, Owlia MB, Mehrpoor, G, Journal of SSUMS, 2009,16(4): 82-86. Multiple myeloma with gangrene of extrimities, Mortazavi MR, Akhavan M, Soleimani H, Owlia MB, Journal of SSUMS, 2009, 17, (3):193-196. Lymphomatoid granulomatosis with splenomegaly, A Halvani, Owlia MB, R Sami, Chin J Lung cancer, Jan 2010, vol 13 (1); 84-86. Ischemic Toes after Venous Thromboembolism: A Difficult Differential Diagnosis with Good Response to Combination Therapy—A Case Report, Case Reports in Medicine, Volume 2012 (2012), Article ID 403685, 3 pages (pubmed indexed). Dermatomyositis sine myositis with membranoproliferative glomerulonephritis, Owlia MB, Hemayati R, Taghipour Zahir S, Moeini Nodeh M, Case Report Rheumatol. 2012; 2012: 751683. “Thromboangiitis obliterans associated with cryoglobulinemia, is there an association?” CPSP journal 2012? Idiopathic granulomatous mastitis, erythema nodosum and bilateral ankle arthritis in an Iranian woman, Fariba Binesh, Mostafa Shiryazdi, Owlia MB, Soheila Azimi, BMJ Case Reports 2013; doi:10.1136/bcr-2012-007636. Low back pain and visual problem as initial presentation of MM associated with SSc, Owlia MB, O Distler, M Foratyazdi, M Akhtari, JCPSP. 2014, 24, S29-31. Thromboangiitis obliterans with cryoglobulinemia., Owlia MB, G Mehrpoor, Journal of the College of Physicians and Surgeons--Pakistan: JCPSP 24 (11 ...). Dyskeratosis congenita; a case with a favorable outcome, Owlia MB, E ARJMANDZADEH, SAM SETAYESH, Journal of Case Reports in Practice (JCRP) 2, 4. Colonic malakoplakia in a child: report of a case and review of the literature, F BINESH, S OSIYA, Owlia MB, MG YAZDI, Journal of Case Reports in Practice (JCRP) 2 (1), 6-8. Pearls and Myths in rheumatology, general topics, (Translation), ISBN: 9879648444476. Simple guide to RA patients. Systemic sclerosis, RRC press, Tehran, Iran, 2013.